Blowing off steam – the healthy way to manage anger | MAX Solutions. Everybody gets angry from time to time, but how you respond to your anger can make an enormous difference. Displays of anger in the workplace can cause significant distress for the recipient and can lead to disciplinary action for the person who is angry. It is the same at home; closeness and intimacy can be quickly eroded by disrespectful communication of anger1. How does anger impact us? Studies2 show that people who experience anger strongly and frequently will have an increased risk for future exposure to interpersonal difficulties. They have lower levels of social support and greater conflict, which leads to more anger. Being able to manage your anger will improve your health3. Those who’ve learned anger management have better physical health as well as mental health. For example, anger discussed in a constructive way has a beneficial effect on blood pressure and people who regularly discuss their anger have better general health, higher sense of self-efficacy, less depression, and lower body mass index. What can trigger our anger? People mostly get angry when they believe that they face a situation where they have been treated unjustly and unfairly3. Sometimes people get angry in response to a pattern of behaviour and often, there is an underlying emotion driving the anger4, which when identified, is much easier to communicate respectfully. If you notice that you are reacting with strong anger to a situation, or series of events, it is worthwhile to spend some time reflecting trying to identify the emotions beneath the anger. For example, if you perceive that a colleague’s poor performance reflects badly upon you, you may feel anxious about the security of your job or you may worry about the impact on your reputation. While anger is the most noticeable emotion, in this situation, it is actually driven by fear. Acknowledging that fear and addressing it, makes it easier to respond to the situation without an inappropriate display of anger. 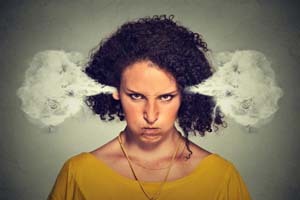 When people communicate with anger, responses are usually angry, defensive or critical; none of which help to resolve the problem or soothe the anger. Researchers4 who have studied married couples have identified that those able to communicate their anger respectfully are better able to find a solution to the problem. Becoming very angry brings with it a range of physiological reactions. Muscles become tense, blood pressure increases, body temperature rises and heart rate increases. Being able to reduce these has a positive effect on your ability to manage anger. Exercise (going for a walk or a run) is beneficial, calming activities such as mediation, yoga and diaphragmatic breathing all help to reduce the intensity of your anger. When you are very angry, it is difficult to see the situation with logic and harder still to see it from the other person’s perspective. However, there are always two sides to every situation. If you can effectively consider others’ perspectives, use logic and be rational you will be better able to manage your anger. It is much easier to reduce your anger and seek alternative perspectives when you are no longer in the environment that caused the anger. Leaving the room, even for a few minutes can make an enormous difference to your ability to manage anger. While expressing anger in a supportive environment can make you feel better, it doesn’t help you move toward a solution. Be clear about the goal you wish to achieve. When you are calm, speak to the people involved in the situation. Identify their perspective and work together toward a solution by communicating respectfully. If you would like some assistance mastering your response to anger contact your EAP on 1800 629 277 or support@maxsolutions.com.au . 5. Thomas, S. P. (2001). Teaching healthy anger management. Perspectives in Psychiatric Care, 37(2), 41-8.